Can't deny it: dressing up in elf costumes and riding with other crazed holiday bike fanatics is apparently very popular. Go figure. Since the board of irresponsibles could care less, it's up to each of us to act alone in our quest for holiday satisfaction. But sometimes alone means together, as is the case this coming Saturday as we join San Diego Bicycle Club for their annual toy donation ride. So pull on those green tights, Dec 14, as we ride from UCC Cyclery on a 50 mile (round trip) toy donation ride to the Kroc Salvation Army. Being judged by other crazies in the costume contest is the least of your worries, it's the photos that keep on living on Facebook you need to worry about. Plan to bring an unwrapped toy and adding some holiday cheer to a child in need. Details here. 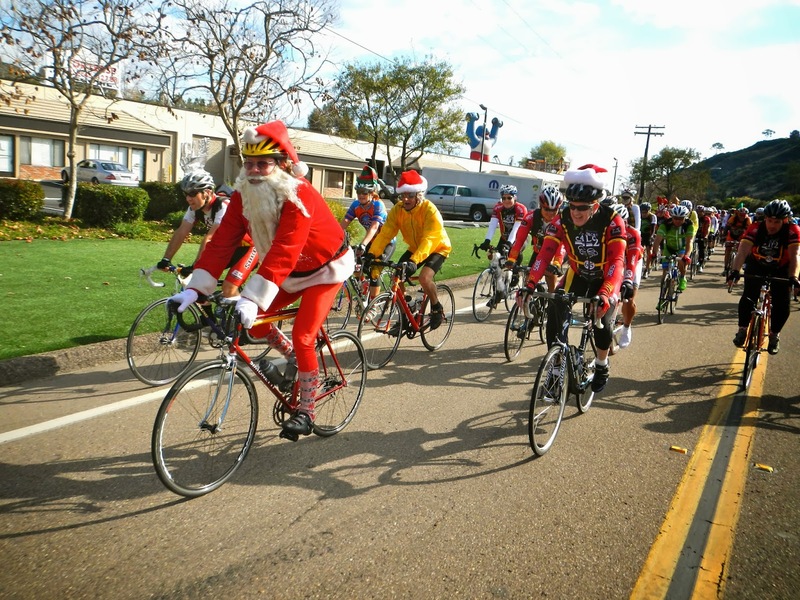 However, this Thursday, Dec 12th at 5:30pm, the San Diego Bicycle Coalition is having their 3rd annual Holiday Joy Ride. It's not free ($10), but there is beer and the route is so easy, you could ride it on a unicycle. That is if you happen to have a unicycle. More details here. Our group meets most Saturdays and does rides from 40-90 miles in the hills of San Diego County. The rides are moderate paced, we regroup often but climbs can be as spirited as your legs will allow. We are striving for two groups, allowing those that are fit to not have to wait as often. We welcome newcomers but ask that they be self sufficient and have lunch money and knowledge of how to get home on their own. No RSVP required. We've managed for decades without tools or stone age tablets. But now that the world is electronic, we've decided to go 'all in'. Signup for our weekly email announcement of our curated rides with the form here. Also, you can follow us on Strava, Twitter and Facebook. Why not, it's lot easier than carving stone tablets like they did in the 'old days'! New Year's Day Ride Options from Burt! © 2013 irresponsible cycle club. Simple theme. Powered by Blogger.